As I mentioned last entry, Cloud Atlas had a “secret screening” at this year’s Fantastic Fest at the fabled Alamo Drafthouse in Austin, Texas. 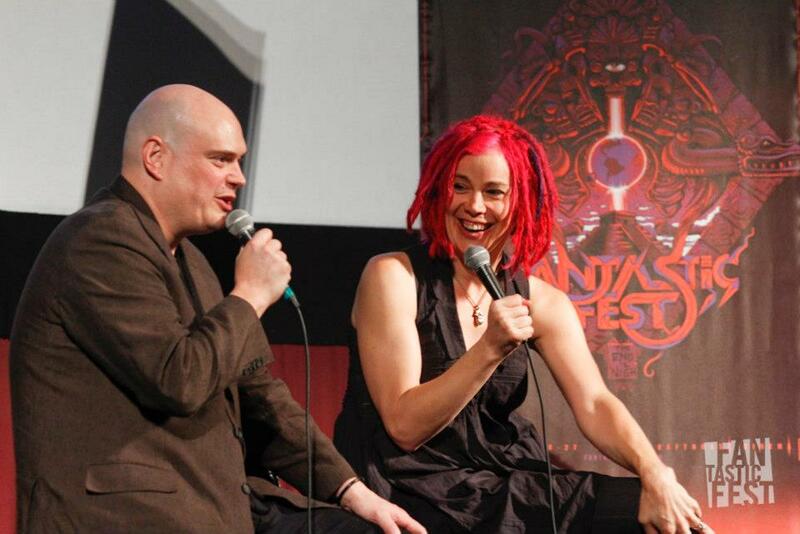 Directors Lana and Andy Wachowski were on hand to receive a standing ovation and field questions from the audience after the screening. Since Fantastic Fest is more targeted to genre fans than the more publicity-hungry TIFF, the response was much more uniformly positive this time around. 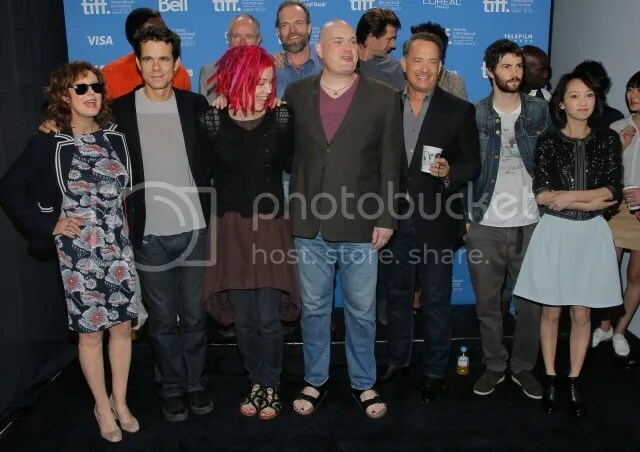 (People attend festivals like this one because they want to see movies, and the higher-profile fests like TIFF because they want to be seen seeing movies… and there’s a certain sort of professional critic who’s immune to any film asking you to love it rather than calculatedly admire it.) But I’m not going to get into a discussion about that sort of thing right now. 😉 Suffice to say it’s more positive momentum for the film and produced another handful of reviews and other various posts worth a read, which I’ll excerpt and link to below. But the most buzzed-about piece of Cloud Atlas advance publicity seems to be this clip, which appeared alongside a New York Times piece by David Mitchell, who wrote a bemused, delightful account of seeing the Wachowskis, Tom Tykwer and the talented cast adapt and bring cinematic life to his novel. The clever fans at Jim Sturgess Online made sure the clip also appeared on YouTube as quickly as possible, which is great because the NYT version has no embedding. I should warn fans who haven’t read the novel and want to know as little as possible about the plot going in that this is very spoilery. I would advise most viewers who don’t already know the plot to stop the second Hanks says “I have fallen in love with Luisa Rey”. His internal monologue featured in earlier trailers, but here we’re shown the context. The clip includes glimpses of all six storylines but focuses on Tom Hanks’ Isaac Sachs (in the 70s-set Luisa Rey nuclear thriller plot) as he contemplates how a seemingly-chance meeting might change his destiny. We also see Luisa Rey herself (Halle Berry), Bill Smoke (Hugo Weaving in full “up to no good” mode), and–from other storylines– Jim Broadbent as Cavendish, Hanks as Henry Goose, Ben Whishaw as Frobisher, Bae Doona as Sonmi-451, David Gyasi as Autua and (from an aerial perspective) Hanks as Zachry and Berry as Meronym crossing the mountains. The clip is only two minutes long but occurs at an important juncture in all six plots. I’d call it a “moment of realization” for key characters. It’s also our first glimpse of how the film’s editing plays out, interlacing the six tales in a different manner than Mitchell did in the novel. 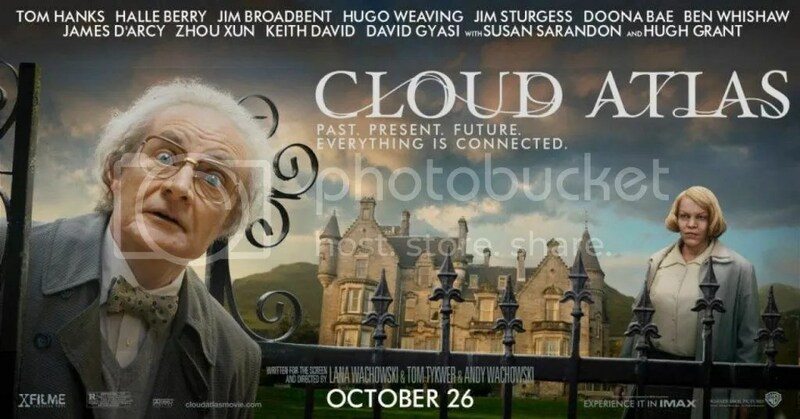 Tickets to the Philadelphia Film Festival screening of Cloud Atlas on October 23 are now on sale; more details here. 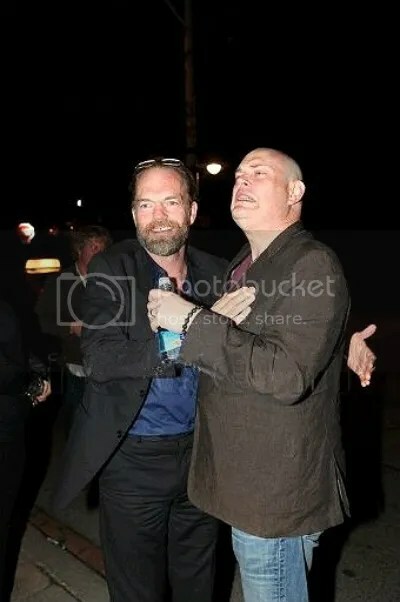 And, finally, I’ve found a bunch of endearing candids of Hugo Weaving meeting up with director Andy Wachowski at the Toronto International Film Festival cast party on September 8. The first six photos are by Todd Gillis/iPhoto, the second five by Neil White/INF. And even larger versions of the seven Cloud Atlas banners have turned up at Filmy-Keeda, via the film’s Indian distributor … I’ll repost the two featuring Hugo under the cut, the rest are here. Also, there’s a new Hobbit poster featuring the dwarves, at the film’s Facebook page. 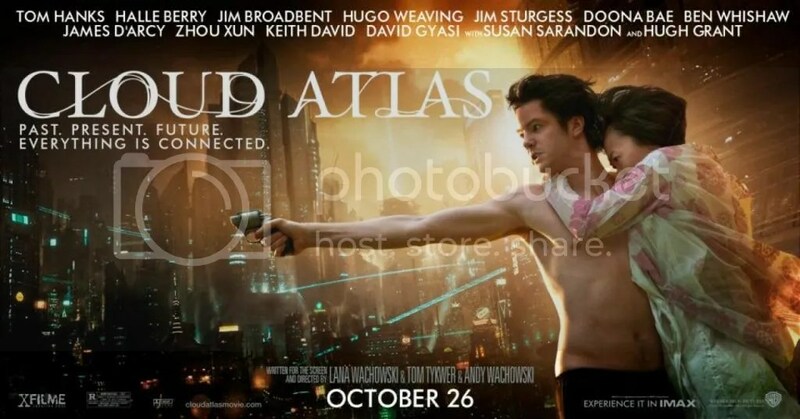 New promotional material for Cloud Atlas continues to appear on a near-daily basis; yesterday seven (!) new promotional banners debuted on thew film’s Facebook page and were quickly picked up by pretty much every movie site out there and reposted at varying sizes; I’ve included the largest versions I could find (under the cut) and will post them in chronological order. 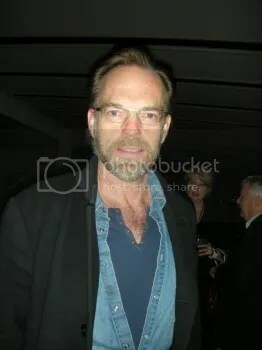 Hugo Weaving appears in those for the Luisa Rey and Timothy Cavendish storylines as the villainous Bill Smoke and Nurse Noakes, respectively. Letters From Zedelghem starring Ben Whishaw as Robert Frobisher and James D’Arcy as Rufus Sixsmith. Set in 1931 Belgium, the story also features Jim Broadbent as Vyvyan Ayrs, Halle Berry as Jocasta, Tom Hanks as the Hotel Clerk and Gotz Otto as Withers the Butler. Half Lives: the First Luisa Rey Mystery stars Halle Berry as Luisa Rey, Keith David as Joe Napier and Hugo Weaving as Bill Smoke. The 1970s-set China Syndrome-ish nuclear espionage thriller also stars Tom Hanks as Isaac Sachs, James D’Arcy as the older Sixsmith (the only character to physically feature in two stories, though there are meta-references galore between plots) Hugh Grant as Grimaldi, Zhu Zhu as Meagan Sixsmith, Ben Whishaw as the record store clerk, David Gyasi as Lester Rey and Bae Doona as a Mexican woman who assists Luisa. 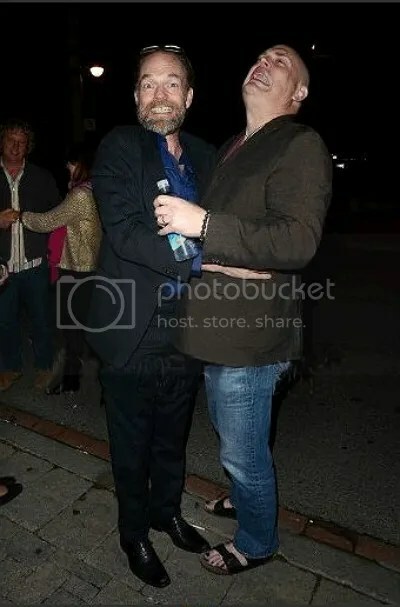 The Ghastly Ordeal of Timothy Cavendish is set in the present day and stars Jim Broadbent as the title character and Hugo Weaving as Nurse Noakes. Also featured but not pictured: Hugh Grant as Denholme Cavendish, Tom Hanks as Dermott “Duster” Hoggins, Susan Sarandon as Cavendish’s “lost love” (called “Ursula” in some cast lists, though if this is the case, she’s a very different character from the novel’s Ursula), Ben Whishaw as another of the nursing home denizens, and Alistair Petrie as Felix Finch. An Orison of Sonmi-451 is set in a futuristic, corporate oligarchic Korea (called Nea So Copros in the novel and Neo Seoul in the film) and stars Bae Doona as Sonmi- 451– she features in all three banners highlighting this storyline. Jim Sturgess, who plays Hae-Joo Chang (an apparent synthesis of the Chang and Hae-Joo Im characters in the novel) is seen in two banners, and the gluttonous overseer (called Seer Rhee in the novel and played by Hugh Grant in the film) is in the first one. 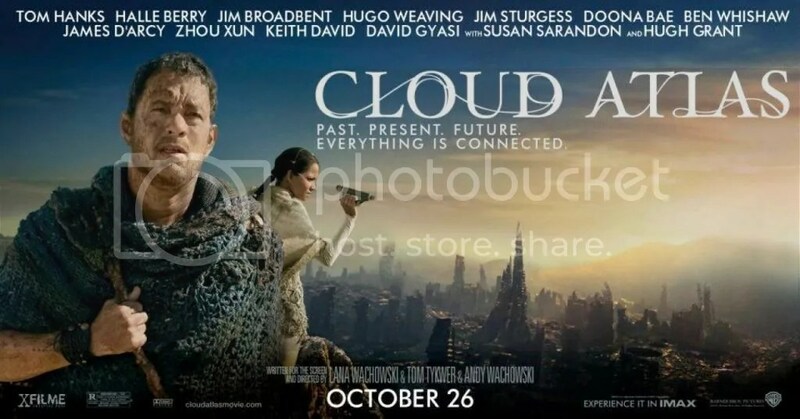 Also featured but not pictured: James D’Arcy as The Archivist, Zhou Xun as Yoona- 939, Zhu Zhu as another Papa Song waitress, Keith David as An Kor Apis, Hugo Weaving as Control, Tom Hanks as the Film Cavendish and Susan Sarandon as Ma Arak Na and Halle Berry as a “male Korean doctor”. Finally, Sloosha’s Crossin’ An’ Everythin’ After is set about 100 years after the events of the Sonmi storyline and unfolds in a post-apocalyptic, tribal-warfare striven Hawaii. Pictured as Tom Hanks as Zachry and Halle Berry as Meronym. Not pictured: Zhou Xun as Zachry’s wife Rose, Hugo Weaving as Old Georgie, Hugh Grant as the lead cannibal, Susan Sarandon as the Abbess, Jim Sturgess as Zachry’s father Adam, and David Gyasi as “a presidential figure” (possibly Meronym’s contact Duophysite). Note: some of my casting notes are guesses based on the novel, early reviews and actor interviews as well as the promotional material now available. The film version has substantially changed some characters (including their names and basic physical characteristics) and omitted or synthesized others. For example, Keith David plays a character named “Kupaka Apis” who appears nowhere in the novel but is apparently related to An Kor Apis, a mysterious figure David plays in the Sonmi storyline. He could be an ancestor of An Kor Apis in just about any storyline (The Adam Ewing plot would be my best guess)– or a descendant in Sloosha’s Crossin’. Neither IMDb nor Wikipedia has a completely correct cast list because both are crowd-sourced and have some omissions or inaccuracies. Ironically, casting notes on the smaller roles at these sites are more likely to be accurate, because they’re posted by the actors or their representation personally. I understand several of my guesses might be wrong… I’m not trying to be definitive before I’ve seen the film. As many viewers who HAVE seen the film have confirmed, part of the fun is guessing who’s who, and how the novel adheres to or changes the novel. 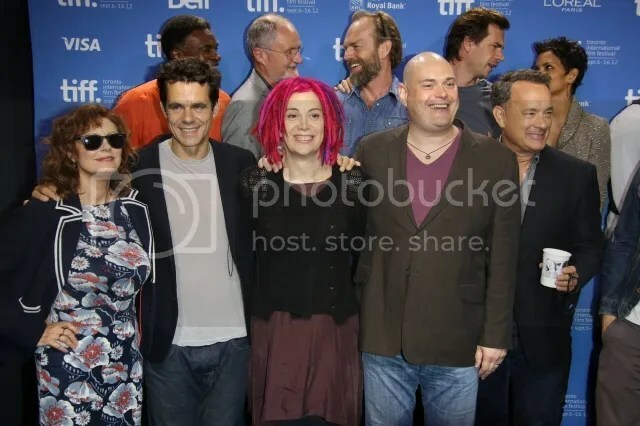 L to R: Zhu Zhu, Ben Whishaw, Jim Broadbent, Zhou Xun, Keith David, Susan Sarandon and Bae Doona in front of Lana Wachowski and Tom Tykwer, David Gyasi, Jim Sturgess, Hugo Weaving, Andy Wachowski (behind), James D’Arcy, Tom Hanks, Halle Berry, Hugh Grant and Alistair Petrie. If you want to do something nice for your fellow fans (and people who, like the James D’Arcy faithful, have provided invaluable research assistance in following this film’s progress) you can buy the Kindle Enhanced edition via Jim Sturgess Online for the regular (and very reasonable) Amazon price. The Orison Edition is not yet available, though it may be bundled with the inevitable Blu-Ray. 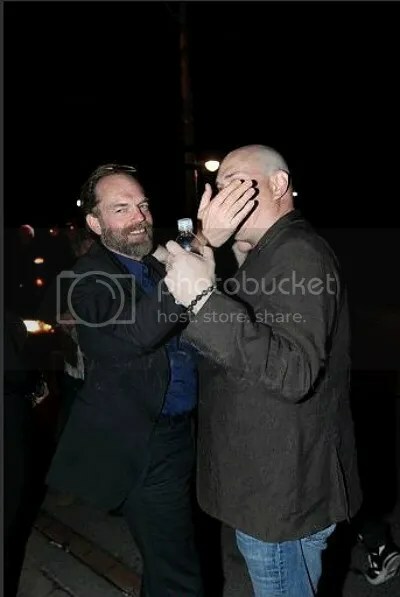 😉 And speaking of Jim Sturgess, he gave an interesting interview to Vulture (as Hugo Weaving did earlier this month) discussing the challenges of playing six characters in Cloud Atlas. 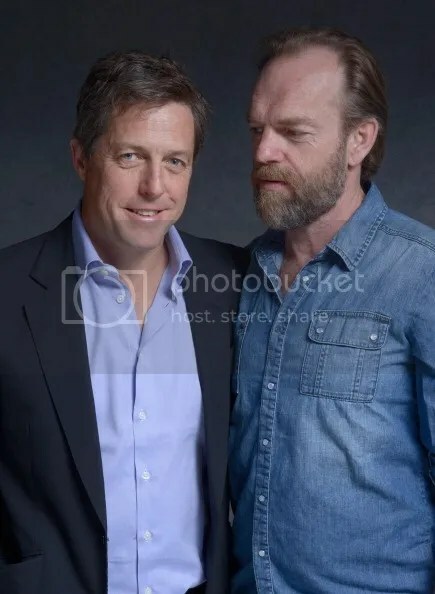 He also (one hopes) provides the final word on the cross-racial casting controversy: if Bae Doona’s mother was OK with Stugess (or other actors, including Hugo Weaving, James D’Arcy, Hugh Grant and Susan Sarandon) playing Asian characters, you should be too. 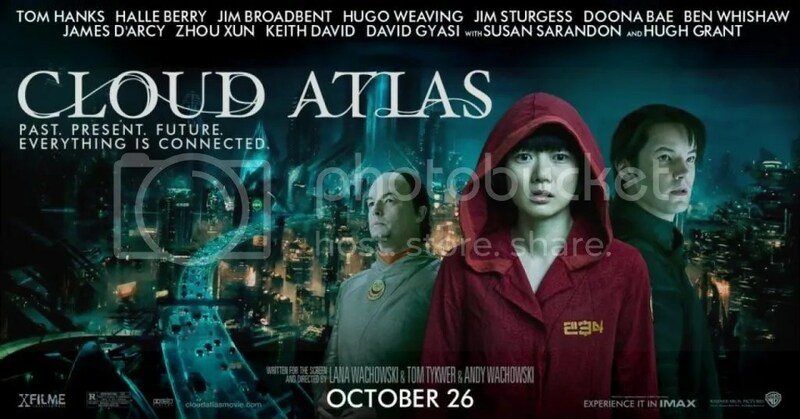 Breaking News: There’s apparently been a surprise preview screening of Cloud Atlas at Fantastic Fest in Austin, TX with the directors in attendance. More news on this as it becomes available. The New Yorker Festival, 6 October (sold out, but some extra tix will be made available at the box office on October 5 at noon), at the Hamptons International Film Festival on October 8 (tickets now on sale) at the Chicago International Film Festival on October 17 (no doubt special to the Wachowskis, as that’s their home turf; more info here), and The Philadelphia Film Festival (more info here) between October 18 and 28 (specific dates announced September 28). 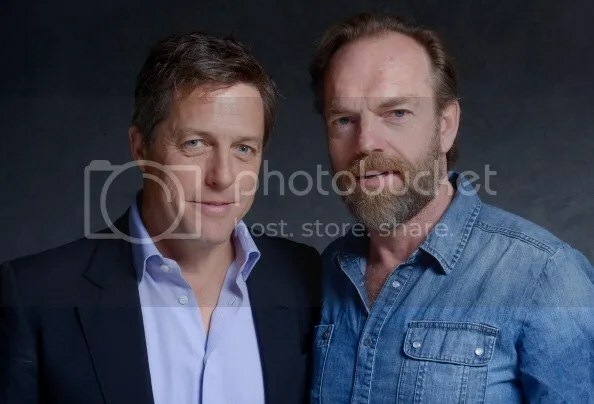 The directors ARE scheduled to appear in New York and Chicago, and I’d guess they’ll be at the other two as well, as they’ve gone all out in promoting this project. 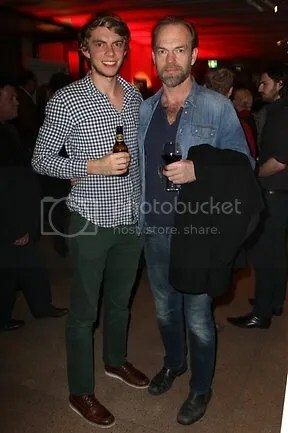 The actors probably will not reconvene until the premiere… I could be wrong about that, but many of them are currently working on other projects at the moment; Hugo Weaving is in Sydney and presumably taking a break. Coincidentally, Oranges and Sunshine had its modest but well-received American premiere at the Hamptons Fest last year… I was fortunate enough to go. The film’s director and author Margaret Humphries were on hand. This time I’ll be going to the New Yorker Festival screening, though I’m still working out travel logistics… I’ll add in other preview dates as they become available. I hope some of you are able to go! 😉 It’s frustrating for European fans that the film won’t open overseas until early next year… all the more so because it’s based on a British novel. When will studios outgrow these tiresome delaying tactics and give fans worldwide equal opportunities to see films at similar times? Don’t they know a lot of us talk globally on the internet? 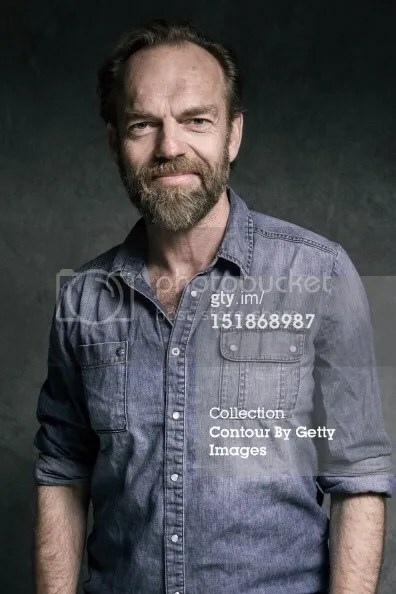 😉 Usually American Hugo Weaving fans have to wait months or years to see his Aussie films too; none of it is fair to the artists or their fans. But if you’re among the fans who have to wait for its formal opening date, you’ll have the consolation of being able to see it in IMAX in some locations. For a film of this scale and visual beauty, it’s a natural choice, and I’m glad Warner Bros has gambled in its favor. More details at The Hollywood Reporter, Screen Rave, Screen Rant and (for the full press release) Boston.com. The only info about the premiere thusfar is via this sweepstakes entry on Fandango.com — they’re offering a grand prize of airfare, luxury hotel lodgings and tix to the event (go fill it out. I’ll wait.) 😉 Again, there’s no official word on whether or not the full cast will be at the premiere, or at any of the festival screenings, but I’m inclined to think yes to the former (at least some of the cast will definitely be available) and probably not to the latter. But we’ll have to wait and see. 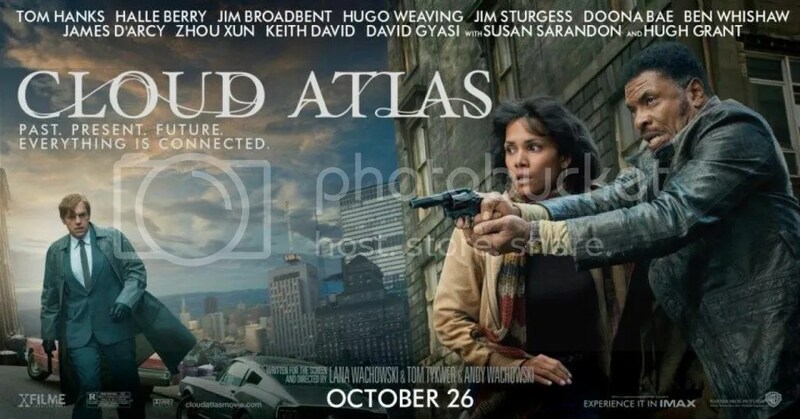 By the way, Cloud Atlas now has a UK Facebook page in addition to the US one. I’ve heard some of the banners are being used on bus adverts already. 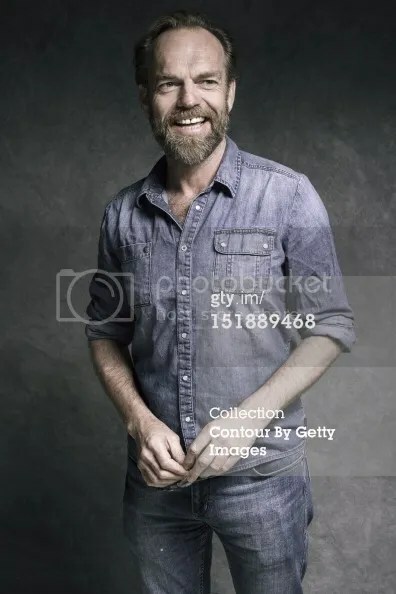 As always, if you know where higher res versions can be found, do let us know. 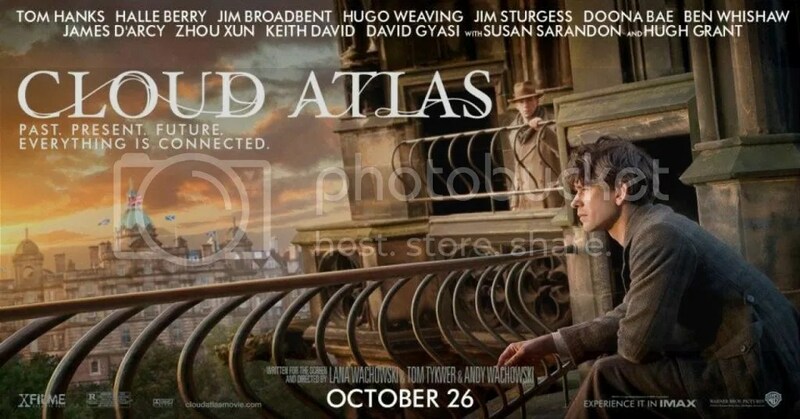 Finally (on the Cloud Atlas front) the film’s Facebook page recently posted a larger version of the Bill Smoke image originally seen in the promotional slideshow back in July. Some film sites hadn’t noticed it before and proclaimed it “a new image“… it isn’t, but good to see, nonetheless. There are a few new tidbits on The Hobbit: An Unexpected Journey as well, though nothing as momentous as the debut of the second, multiple-ending trailer recently. (If you missed it, see the previous Hugonuts entry or the Official Hobbit Website.) For analysis of the trailer, screencaps and new images (including a new, Bilbo-centric poster), see The Hobbit Films, We Are Movie Geeks, TIME online, Comic Book Resources, Flickering Myth and (of course) TheOneRing.net. 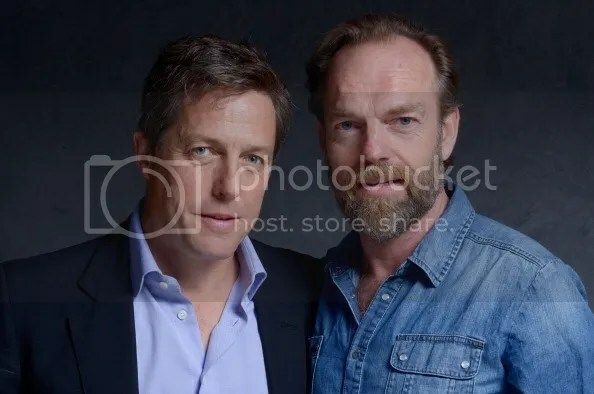 The BBC has news of the film’s Official Royal Premiere in London on December 12, two days in advance of the official opening, and a couple weeks after the Wellington Premiere. (The news report lists the cast but doesn’t specify if they’ll be in attendance.) Finally, if you want to be read bedtime stories by Gollum (and who doesn’t?) 😉 go here. And if you really want advance tickets far in advance for An Unexpected Journet, TORn reports that you should be ready at noon on November 7 (….in the US). 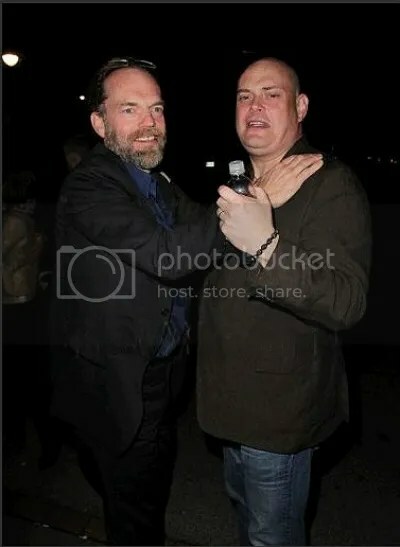 If you go to the official Hobbit website, though, you can see four alternate endings, including one with more Hugo Weaving footage which explains the origins of “Sting”, the Elven sword Frodo later obtains in Lord of The Rings. Unfortunately none of the four alternate versions can be directly embedded yet, though I’ll add them the moment this changes. The only change is to the final scene in each case, but in my personal opinion, the four “alternate” versions are better than the “official” version, which, though amusing (love James Nesbitt’s remark) suffers from slightly dodgy CG. The other four versions are more character-driven, still wryly funny, and make one interested in seeing how it all plays out. A lot is familiar to anyone who’s read the book, but the tone is distinctly darker, so the film is more of a companion piece to Jackson’s earlier trilogy. (I have no issues with this because… well, obviously, I rather liked Jackson’s trilogy.) 😉 Anyhow, here are links to the other four versions: Sting (this is the one Hugo fans will probably like best), Bilbo, Gollum, Gandalf. Some fans are claiming Hugo’s been digitally “de-aged” in this… those closeups pretty much disprove that. Certainly he’s wearing makeup like all of the other actors, but I’m glad they haven’t tried to use CG on his face. I can suspend disbelief– that’s why you hire great actors in the first place. 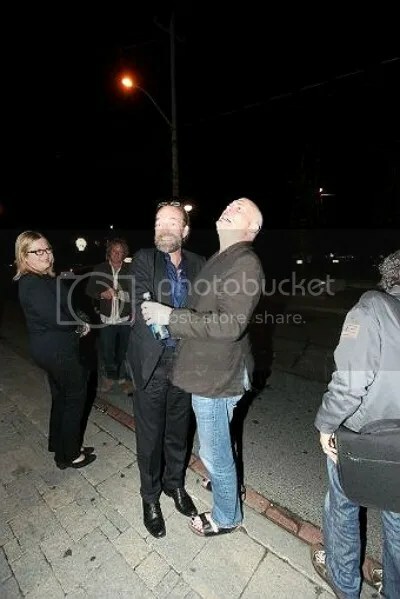 Finally, I was finally able to access my WireImages account and get unmarked copies of these TIFF photos; they’re not large or high-res, but nice to see anyhow. 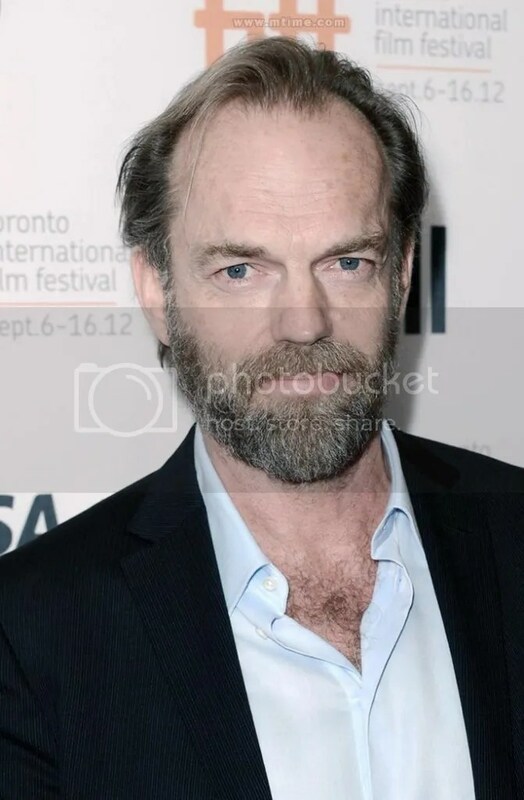 All were taken on September 8-9 at the Toronto International Film Festival. 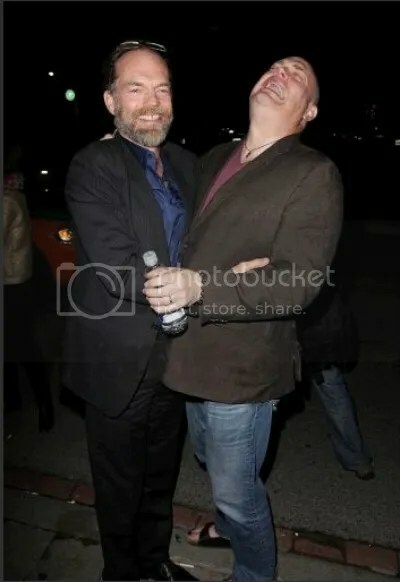 Those withy Katrina were taken September 8 by Eric Charbonneau, those with Hugh Grant on September 9 by Jeff Vespa. 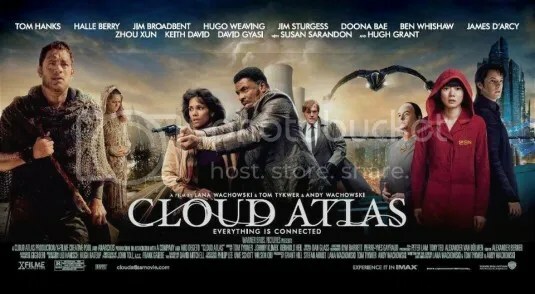 Cloud Atlas is still spaking a lot of debate and curiosity out there, so I’ll post another selection of review links. Also, Peter Jackson is revving early Hobbit promotion into high gear… only a couple more months until An Unexpected Journey premieres. Can you believe it? Indications so far are that it’ll be well worth the wait. 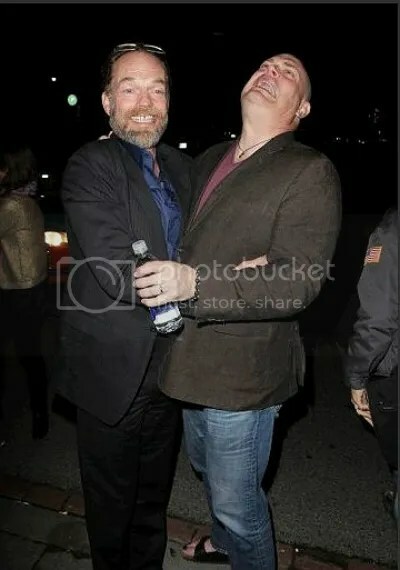 Another pair of photos from the Torionto International Film Festival premiere of Cloud Atlas have surfaced; alas, even Getty Photo mermbers can’t see these without watermarks unless they pony up. Pity, because they’re wonderful, earthy portraits. (For the record, I disagree with this guy’s assessments of 2001 and Metropolis, which are two of the greatest movies ever made. I do agree with him about the others. Can’t say where I’d place Cloud Atlas in this spectrum until I see it, but by Ray Bradbury’s definition, the entire work (film version or novel) can be categorized as science fiction: scifi isn’t defined primarily by zap guns, future settings or fantastical elements so much as speculation on how technology (and… uh… science) impacts the lives of those unprepared to deal with its ramifications, as well as the choices human beings are forced to make whehn confronted with change. 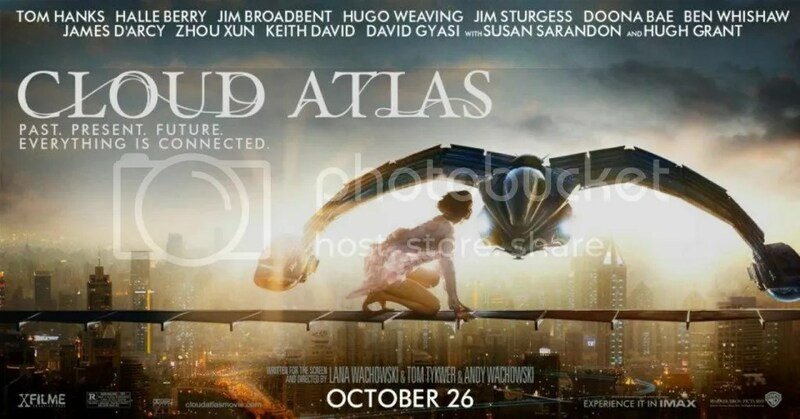 The overarching plot of Cloud Atlas involves civilizations being corrupted and eventually laid waste by human greed and unregulated technological excesses; even in the earliest-dated segments, groups of people are threatened by more advanced societies. So the whole story is science fiction in a classic sense. There’s also a brief primer on the novel’s structure ansd themes (and confirmation that Hugo has indeed been cast as Horrox in the Adam Ewing sequence of the film) at Tom McGee’s blog, one of the more enlightened assessments of the casting choices (and why it’s not “a gimmick”) at Kentballs.com, More on Halle Berry’s characters (and some quotes from various TIFF press conferences and interviews) at Books N Review, a profile of Bae Doona, who has one of the most universally lauded performances in the film as Sonmi-451, and Chosun Ilbo (English), and a new Susan Sarandon interview with more enthusiasm for Cloud Atlas at Indie Wire. Finally, as I hinted up front, it’s officially Hobbit Week (according to Peter Jackson, anyhow) and we’ve been treated to another batch of new stills from the first film, including the first image of Sylvester McCoy’s Radagast the Brown, more dwarf action, Gollum and Gandalf. No new Hugo material for awhile now, but we all knew going in that Elrond isn’t a major character in The Hobbit, so we’ll have to wait and see how much supplemental material he’ll get to flesh out in films 2 and three. Go to Empire Online, Screen Rant, Radio Times and (of course) TORN for a look at the new images… there have actually been several batches this month. But the most exciting news is probably that we’ll finally have an official trailer for An Unexpected Journey on September 19, ie in two days, plus “special content for the fans”. 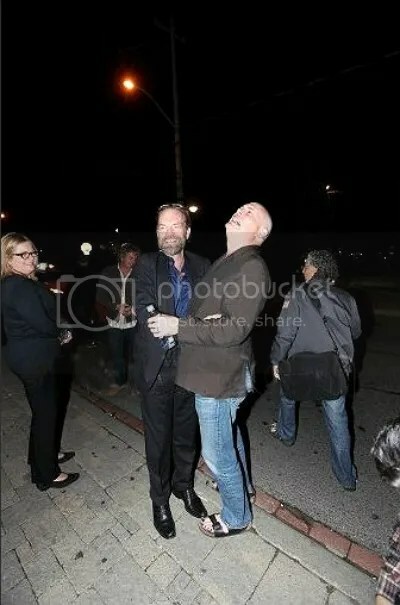 (Oooooh!) 😉 (The first trailer was technically a “teaser”, assembled before the film was complete.) 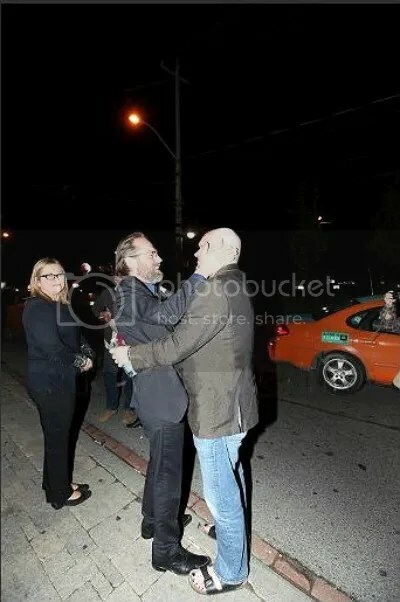 Here’s PJ’s announcement… let’s hope we finaly get to see Elrond footage this time around!